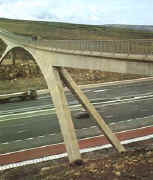 Most people will be familiar with the narrow concrete footbridges and the concrete cattle bridges which cross some of our rural motorways. Sometimes these allow a farmer to move cattle across a motorway, without the need for the use of trucks and trailers. Cattle bridges can be fairly narrow, concrete affairs; as the cattle are herded by the farmer, and forced across together; and are more than happy to walk along in a tight group. At other times they are used as narrow concrete footpaths and horse-riding trails. A more recent concept is to build so-called wildlife bridges to act as a cross-over point for the motorway or a railway line. Whilst a traditional cattle bridge might only be 2 or 3 metres wide, a wildlife bridge might be as wide as 20 or 30 or 40 metres or even wider. The top of the bridge will be a truly green space, complete with grass and meadows and shrubs and perhaps even a few small trees. So far as the car or train driver is concerned, he or she is passing through a short tunnel. So far as the wildlife is concerned, they appear to be walking or running across a solid area of safe ground. They are less spooked by traffic noise from below; and, perhaps just as importantly, less pressured by other animals or prey species as they can maintain a larger separation distance between themselves. One example of why this is important is that hedgehogs may be in fear of their lives from badgers; and will avoid badgers as much as they can. If a badger has marked its territory within the past 3 hours or so, the hedgehog will tend to avoid the area. If a wildlife bridge was very narrow, this may well mean that the hedgehogs were always too frightened to cross the bridge; which might well have a seriously adverse effect on territorial boundaries and wildlife survival rates - especially where cubs and prey species are involved. If the wildlife bridge is very wide, a frightened hedgehog may well be able to cross the bridge on one side, and a scary badger on the other side; and each species live in comfortable harmony with one another. A wide wildlife bridge is also much safer in terms of accident reduction, as you can be fairly certain that wildlife will not be on the carriageway; as you can fence them out; and they have a safe easy route to use instead which looks just like any other bit of countryside to them. Because the wildlife bridge goes over a motorway or a railway line, it is obviously much higher up, meaning that there is very little chance of flooding; and the possibility of catastrophic pollution damage (such as salt-water run-off or oil-spills) is much reduced. It is not beyond the bounds of possibility that wildlife tunnels might become polluted with oil or chemicals spills; or with the unpleasant "run-off" water that washes off major roads. Such run-off water often has damaging levels of oil and petro-chemicals; and, in winter, may have very high concentrations of road-salt and grit. Whilst water run-off may be dealt with by drainage or the double-ditching technique; this is not always good enough in flood-prone areas and tunnels may be at risk of flooding or pollution. In many circumstances the additional effort required to make a wildlife bridge (rather than an enormous cutting may not be hugely significant in terms of the overall cost of the project. Traditionally the materials dug out of the ground to form the deep cutting may have been trucked away. 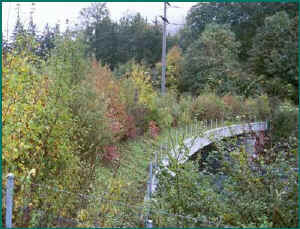 With the wildlife bridge, they can simply be reinstated once the tunnel roofing system has been put in place. This technique, known as back-filling, was used when the canals were first being constructed; and has since been used for railway construction too. As well as these wide wildlife bridges allowing animal territories to be maintained, rather than being divided into smaller, less viable islands; they also have ancillary effects for the wider countryside. They do provide a small amount of recompense for the monstrous damage done by laying all that concrete and tarmac; and they may well be less intrusive in terms of traffic noise, visual amenity than an enormous great steep-side cutting. After all, a cutting will always look like an ugly cutting with a strip of concrete in the bottom. At least a wildlife bridge will look like a bit of green countryside with a tunnel underneath!